I was looking for a meatloaf recipe and I remembered that there was a good Tex Mex one in my Cooking Light cookbook I served this with my BBQ Succotash and a salad of arugula, fennel, red onion and tomatoes with a light lemon vinaigrette. To prepare meat loaf, chop the chiles. Combine chile, adobo sauce, onion, and next 14 ingredients (through ground turkey breast) in a large bowl, stirring to combine. Place turkey mixture in a 9 x 5-inch loaf pan coated with cooking spray. Bake, uncovered, at 350° for 30 minutes. 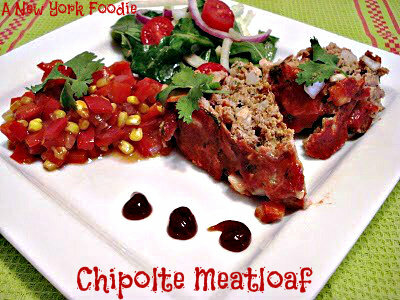 Wow – what a flavorful and delicious looking meatloaf.